Sophomore guard Khalif Wyatt paid his dues before earning his role as the sixth man. Coming out of Norristown High School, sophomore guard Khalif Wyatt of the men’s basketball team was undeniably “the man.” Since becoming an Owl, however, Wyatt has been forced to work harder just for a chance to see the floor. While at Norristown, Wyatt was named Second Team All-State during both his junior and senior years. As a junior, Wyatt led his team to a 33-2 record en route to a state championship game appearance where his team fell to Chester High School, which was led by Wyatt’s future teammate, sophomore forward Rahlir Jefferson. As a senior, Wyatt averaged 20 points, four rebounds and four assists per game while, leading Norristown to the Pennsylvania Interscholastic Athletic Association AAAA District Title. Wyatt’s accolades helped him accrue offers from Niagara, Delaware and La Salle, along with Temple. When it came down to it, however, Temple coach Fran Dunphy’s straightforwardness led the 6-foot-4-inch guard to take his talents to North Broad Street. One of the necessary points of improvement Dunphy mentioned was Wyatt’s fitness. In high school, Wyatt struggled with maintaining his weight, despite his constant efforts to shed his baby fat. 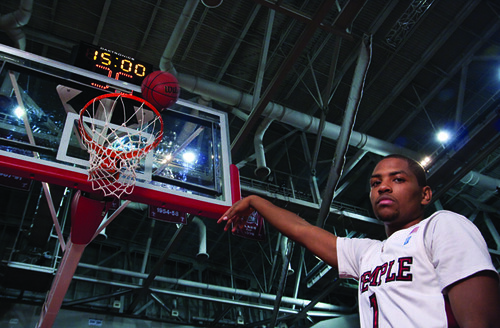 At Temple, Wyatt saw limited playing time, appearing in 10 games during his freshman year while scoring just five points. Wyatt’s sophomore year at Temple has produced drastically different results. During the offseason, Wyatt got in better shape and concentrated on playing defense, something Dunphy requires from all his players. Wyatt’s hard work paid off as he, along with sophomore guard TJ DiLeo, quickly became one of the first guards off the bench. When junior guard Juan Fernandez was forced to miss games because of a bone bruise, Wyatt found his way onto the team’s starting lineup. With the extra playing time, Wyatt, over the team’s last seven games, has averaged 14.4 points per game. On the season, Wyatt is fifth on the team at 8.7 points per game, while playing 16.4 minutes per contest. Wyatt’s play has put him in consideration for the Atlantic Ten Conference’s Sixth Man of the Year award, an honor junior guard Ramone Moore earned last season. Wyatt’s decision to come to Temple forced him to bide his time while increasing his work ethic in practice and in the weight room. In the end, however, Wyatt said his decision was the right one. After missing out on March Madness, the Owls will begin NIT play on Wednesday. Redshirt-senior guard Josh Brown played a team-high 32 minutes in Temple’s, 70-60, victory against Jefferson University on Thursday at the Liacouras Center. Any helpful hints what the most essential instrument for easy woodworking project? Certainly I already have some cordless tools, as you can tell on my website. Somebody necessarily asssit to make severely posts I’d state. This is the first time I frequented your web page and up to now? I amazed with the research you made to make this particular put up extraordinary. Great activity!